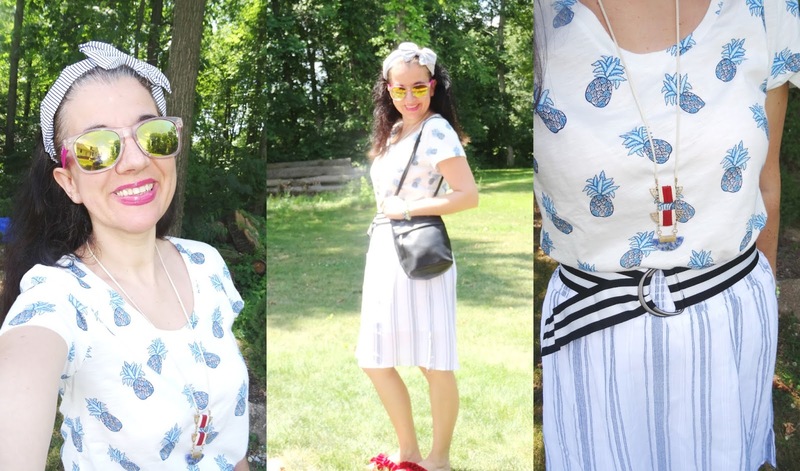 Skirting it in White+Blue with Stripes, Pineapples and Ruffles. 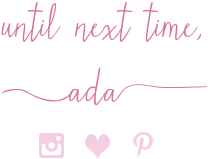 One of these days I will A) Get Back to a more normal blogging schedule and post at least 4 or 5 times a week. B) Get back to linking and commenting daily. C) Finally start showing/blogging some Fall Outfits. But today is not that day. This week is not that week! 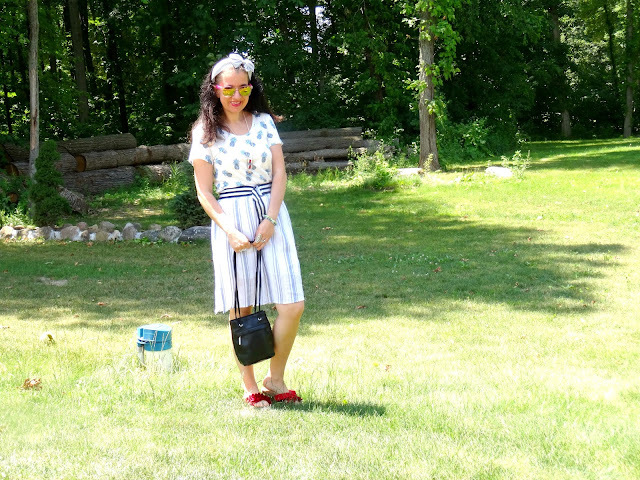 Therefore you get this Summery Outfit from July when I was wearing skirts almost every day and even blogged about them. My Summer Outfit today revolves around a Knee-High Pinstriped Skirt (by Target) with White+Blue Stripes and doses of Pineapples (my V-Neck Tee also in white+blue by Loft) and Ruffles (my Red Faux Suede Slide Sandals by Target). 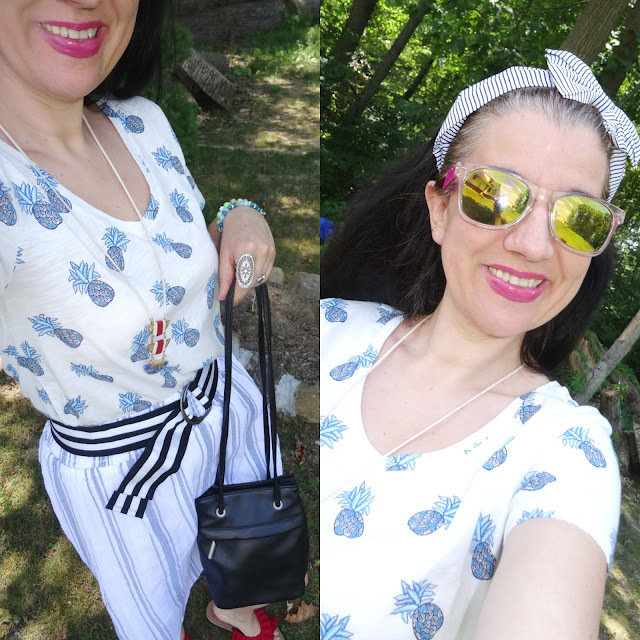 In the Summertime my favorite color duo to wear is white with blue - any shade of blue: sky, cobalt, turquoise, midnight, navy, baby blue - no wonder all the retailers come up with a lot of white+blue prints like my Cute and Comfortable Elastic-Waist Striped Skirt and my Scoop-Neck Pineapple-Print Tee. What I love to do with white+blue prints is add a touch of red. It is very Americana and perfect for Memorial Day, 4th of July and Labor Day. My Faux Suede Ruffled Slides (these ones - they are so cute!!) did just that as did the touch of red on my Long Fun Woven Necklace by Target. I also added a touch of pink via the fuchsia Lipstick and the Hot Pink-Framed Sunnies. I also mixed a lot of stripes in this look as my Wide Grossgrain Belt (part of a Target Dress) and the Big Bow Headband (Vivian's lol) both have black+white stripes which I don't think clashed with the striped skirt and also the white picked up all the white of the outfit, while the black brought out the Black Leather Little Bag which I have had in my closet for over a decade (the leather has softened up so much by now; I remember it being a designer bag). Despite all the patterns and multi stripes in this look because the white, blue and some black dominate the entire outfit, in my opinion this is a monochromatic look. What do you think?! !